Your child recently took the Indigo Assessment, a comprehensive, multidimensional assessment based on 35 years of research. Indigo is working in schools all the time to help students, teachers and administrators better understand each other. But one of the most important relationships we work with is the one between parents and their children. Indigo has created a unique resource page to guide students and parents through the assessment together, learn about their similarities, differences, and how parents can help their kids succeed based on who they are. The Indigo Assessment measures behaviors according to the DISC system, a tool that divides behavior into four basic styles: Dominance, Influencing, Steadiness and Compliance. DISC scores indicate natural responses to everyday circumstances. The Indigo Assessment measures 6 Motivators as described in the work of Drs. Eduard Spranger and Gordon Allport in their study of human value, motivation and drive. Motivators describe why people do things: the internal desires that drive behaviors. Through use of a Likert-Scale questionnaire, the Indigo Assessment measures 23 non-academic competencies relevant to workplace success. 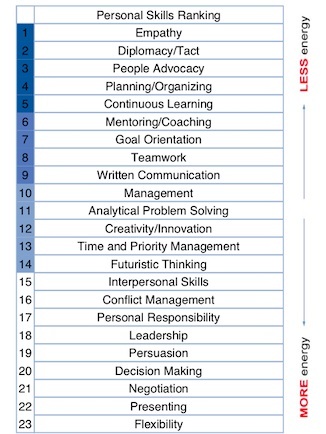 This list includes key personal and inter-personal skills. Your top 5 skills point you toward areas of talent that you may or may not already know you possess. The Indigo Experience: click to learn more about the different attributes associated with your child’s Indigo profile. Skills: click to learn more about the 23 skills profiled on the Indigo Report. Based on the assessment results, each DISC trait is ranked on a number from 1 – 100. Anything below 50 is considered “low” and anything above 50 is considered “high.” Just because a score is “high” in one trait doesn’t mean it is “good” and because you are “low” doesn’t it is are “bad.” There are benefits to all scores. Motivators are ranked on a scale of 1 – 10, with one being the least passionate and 10 being the most. If your score falls above the adult average, we consider you “passionate.” It is important to try to fulfill your top two motivators and might be wise to avoid your bottom motivator. The entire Indigo Report offers hundreds of possibilities for conversations with your child. We chose four important elements of the assessment and offered some guiding questions and videos to help fuel the conversation. The front page of the Indigo Report features a quick overview of each Indigo Attribute. To learn more about your specific Indigo Attributes, go to the “Indigo Experience” page, with videos on every DISC and Motivator, and further resources about skills and strengths. Which strength stands out to you the most? Which strength stands out to your child the most? Are they the same or different? Is your child’s top motivator something they are actively pursuing? How does your child see their motivator active in their every day life? Because everyone has a different personality and behavior style, everyone prefers different methods of communication. Often times we find ourselves using the communication methods we prefer as opposed to considering the style the people we are talking to prefer. Have your child recall a time when someone (perhaps you!) used a communication method that was on there “Don’ts” side. Have them explain how it felt, and why it was awful. What does your child believe is the most important thing to keep in mind when communicating with them? Come up with a “communication plan” for you and your child. What will you do when things get difficult? How will you each let the other person know when things are going well or when you need to check back in? At Indigo we like to focus on our strengths and what we are naturally good at. However, with every strength comes a weakness. Rather than seeing these as blindspots, these can be used as opportunities for self-awareness and becoming a more well-rounded individual. Have your child choose their number one time waster, and talk about when they feel that way. Identify which time waster is directly related to one of their strengths, and discuss how strengths and challenges are often related. Come up with some real-life, attainable solutions for your child to begin to overcome these time wasters or be conscious of their experience. The Indigo Report comes with a list of some fields that might be interesting to you based on your behavior style, motivators, and skill sets. Looking at this list can help you begin to think about what careers exist, what careers you might want to have, and the education and training you will need to obtain them. Have your child choose five “degree matches” that they are excited about and explain why. Have your child choose three “degree matches” they really do not like and have them explain why. Then have them try to find some positives in those degree matches. For two of the top “five,” ask your child what they hope to succeed, and what they believe it will take to get there. Tom talks about how Indigo helped his teachers & parents recognize his unique value, which they didn't see before. "I would have paid $1,000 for this." Carey talks about the impact Indigo has had with her and her daughter and how it helped strengthen their relationship. Student & Parents Reactions to Indigo! Students and parents react right after seeing their Indigo Assessment results for the first time!